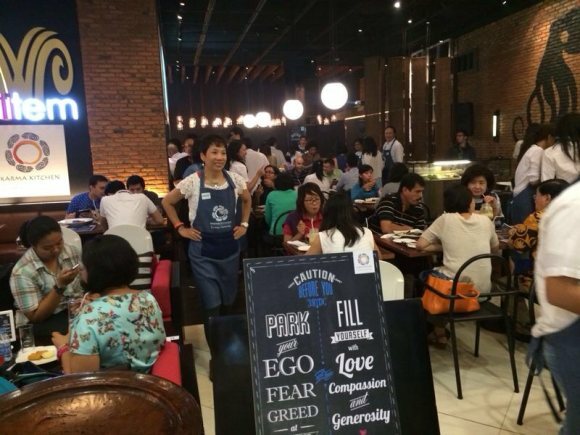 We were thrilled to start Karma Kitchen in Indonesia this month. We started the day with a pre-recorded video address by KK founder in Berkeley, and as the day progressed, it led to so many beautiful moments. My heart is touched to see our growing international family and our shared values of generosity, compassion and inter-connectedness. Looking forward to spreading more love and light together with all of you. What started off as a "wild idea" email took a beautiful form on 21 Dec, 2013 when we had the Karma Kitchen at Fountainhead School, Surat. To say the least, love was in the air!!!! the idea was to practice peer to peer generosity and we actually flexed all our generosity muscles. The results were amazing! If a stranger walked into Karma Kitchen without knowing anything about it, how long would it be until she suspected that something was out of the ordinary? To make this question more interesting, let's assume that she evaded the maitre d's warm welcome and somehow managed to avoid conversations with volunteers and fellow-guests. Would she have to wait until she got her check for $0 to know that this isn't the average dining experience? Or would she figure it out sooner? This is one of the thoughts that popped up after serving today. I was essentially asking myself "What are Karma Kitchen's most apparent identifying characteristics?" The answer may be different on different days, but today it was unmistakable - there were smiles everywhere. Guests smiled as soon as Keith informed them that they were participating in an experiment in kindness, when they shared their life stories with strangers at the community table, as they listened to musical offerings by Sharanya, Debanjan and Shreya, when they were tagged with unexpected gifts from Audrey and when they received surprise hugs from their servers. Smiles were KK's fingerprint today. Ringing in the New Year KK Style! So much transpired that could not have been planned for...There was the proud little girl who lost her first tooth at Karma Kitchen :) There was the table of 10 that tagged Alisa with a beautiful necklace even before she'd taken their orders. There was the man who when asked if he wanted dessert, gestured all around him and said, "This IS my dessert." There was the woman who had planned a big birthday gathering at the local Thai temple only to find out at the gate this morning that they were closed today. A serendipitous sequence of events then led their party of 15 to our door. There were the two chefs from SF who were wowed by the food, but even more so by the spirit behind it. " When you put love into what you do everything changes -- doesn't it?" they reflected. Indeed it does. Love was definitely in the air when a bouquet of roses was presented to the birthday girl as the whole restaurant sang to her. Love was definitely in the air when a guest exclaimed, "I look forward to Karma Kitchen like a kid looks forward to Christmas! And when an elderly man and his wife who had started their meal complaining about local politics and corporate greed ended it by saying, "Please thank EVERY single person who helps make this place possible. It means the world to us." And when a family of four who had spent more than two hours on the road to experience Karma Kitchen found themselves tagged with peace chains and heart pins. And love was Definitely in the air when one of the volunteers switched a guest's credit card for his own and tagged them by covering their meal (without their knowledge!). We couldn't have asked for a better send-off party for 2013 and we're looking forward to more adventures in generosity in 2014! 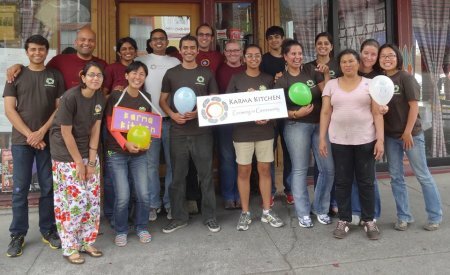 Karma Kitchen Berkeley returned with a bang, with guests from all around the bay-area and some serendipitious guests from other countries as well! Keith and Praveen rallied the troops, while Lalita, Cat and Ayako built up the ambiance, and a full crew of volunteer helped serve over 100 guests. After a full day of giving unconditionally, busing tables for guests, Pranav noted: "I know I'm young, but it was the best day of my life." What stole the show, though, was a surprise wedding proposal! Lots of cheers, songs, red roses for random guests, and smiles all around. The full story is quite amazing actually. And we piloted a new idea as well. Prior to the launch, we asked guest to see if they wanted to stay connected after the event. 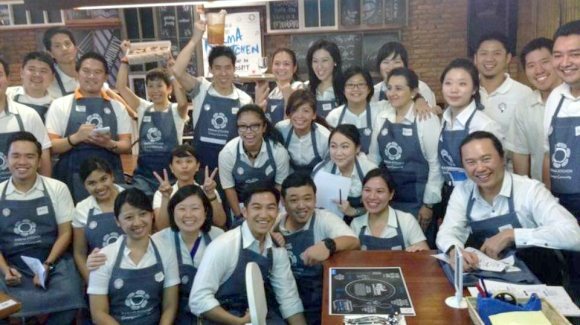 Over 80 folks responded by saying yes, so we launched five mini events to deepen service ties amongst the KK community. Fruita Gift: Join a one-of-a-kind community in Oakland that grows, gleans and gifts fresh, organic produce to children and families living in challenging environments. Green Gulch with Grace: Participate in a circle of sharing with an incredible wounded healer, who is a lifetime student of Zen, a celebrated AIDs physician, and survivor of a devastating accident that left her wheelchair bound but with a spirit that's gloriously unchained. Hear The Homeless: Join a group of volunteers to pay-forward the blessings of love and nourishment to underserved communities at a local soup kitchen, and to simply share presence and stories with people who are all often too easily ignored or avoided. Eye of the Whale: Join a mini-expedition to the beautiful setting of Monterey to meet with a photographer who has dedicated himself to capturing life-size images of whales, and connecting humans to the wonder, mystery and kinship we have with these beautiful, extraordinary creatures of the ocean. Each of these grassroots events will be led and coordinated by a KK volunteer. The hope is that these events will help foster deeper community and interconnection while also giving people opportunities to deepen their values, practice small acts of service, and participate in wisdom circles. Berkeley is Set to Resume! 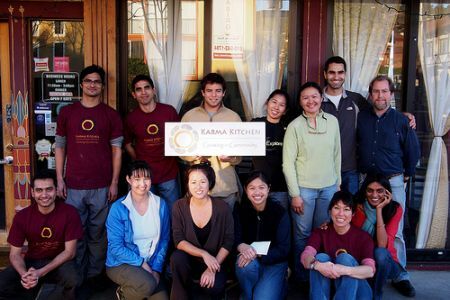 As you might've heard, Karma Kitchen Berkeley is returning this Sunday! In this iteration, we are starting out with once/month but are trying out some more experiments on building deeper ties amongst KK guests. In particular, if you're planning on coming, please RSVP here and we hope to creatively connect those people in smaller groups before the next Karma Kitchen in August. We're all super excited, have a few surprises set-up for opening day, and are looking forward to seeing you. 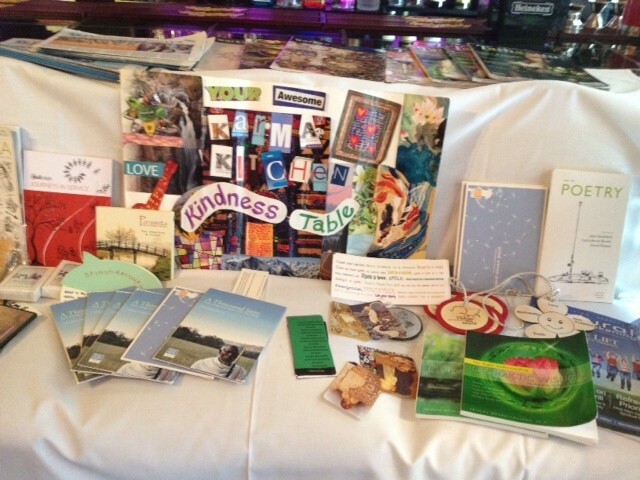 June of Abundance at Karma Kitchen DC! "This was WONDERFUL. 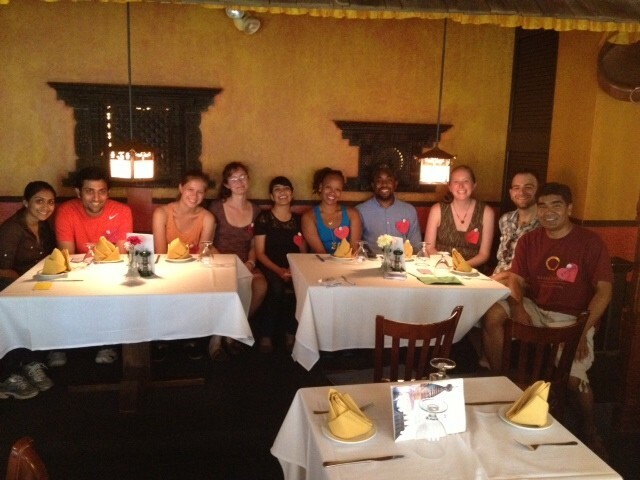 Met new friends, ate tasty food... We will be paying it forward today, next month, and beyond." - From a group of friends who totally enjoyed their experience, creating ripple effects of the paying it forward principle. 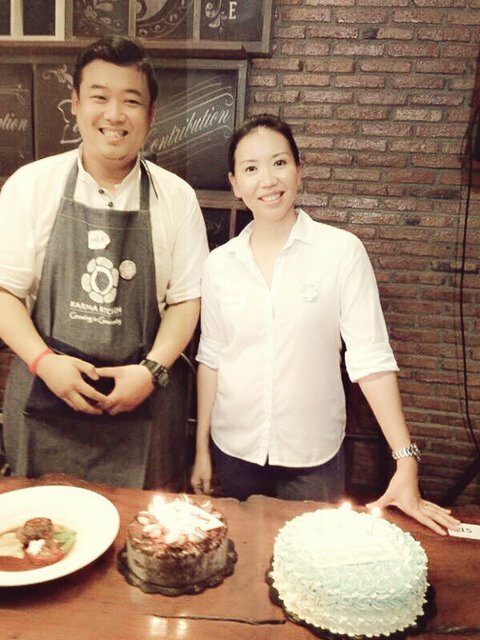 The June edition of Karma marked another milestone in Karma Kitchen's historic journey. A journey of moving, from Transaction to Trust, from Isolation to Community, and most importantly from Scarcity to Abundance. The day's theme was Abundance, and we could witness it right from the moment our first set of volunteers set foot at Himalayan Heritage, all the way till the last person left the premise after a satisfying day of bringing kindness and cheer to our guests of the day. Some of the first time volunteers understood, absorbed, and radiated the love that Karma Kitchen represents - The kind of love whose abundance grows with more distribution of it. All volunteers not just had a spring in their strides, but also brought their smiles to guests by their warm greetings and service. In addition, they were also willing to step into each other's roles that helped set a gracious tone. We served about 74 guests. It was very inspiring to see some volunteers who drove all the way from NJ, and Baltimore, keeping their enthusiasm the whole time. KK DC has been really great place to meet like-minded people, which has been more evident by the happy faces when they meet either a guest or co-volunteers who share the same interest. Like one of the new volunteers Sarah, who had been looking for some food sharing community finds our veteran volunteer Aakruti who has started a Dinner swap group. In the theme of Abundance it was really great to see how abundance is created in a space like Karma Kitchen. As one volunteer commented, she was amazed how guests were served abundantly and nobody returned without feeling full, physically and spiritually. Imagine a restaurant where there's a no check policy and in its place is an invitation to pay it forward for those that dine after you. Though strangers in line, you're asked to give a contribution as a gift to the person waiting behind you to compensate for their meal. 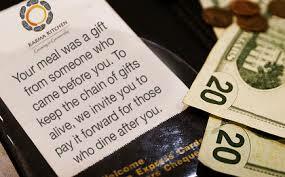 That's what Karma Kitchen is all about, the serving of meals through the generosity of others. The last Sunday of each month, Karma Kitchen opens up its doors form 12 p.m. to 3 p.m. for those who reside in the D.C. area. 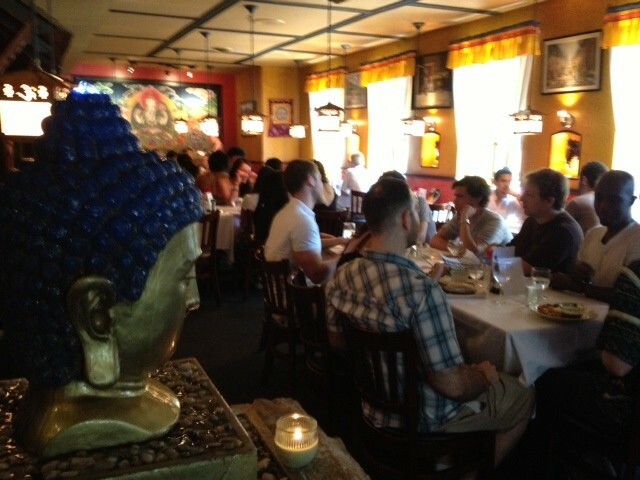 While on the outside it appears to be the traditional Himalayan Heritage Restaurant we've all grown accustomed to walking by in Adams Morgan, once you enter you'll find one of the most heartwarming depictions of pure goodness in the District. Smiles, good food, kindred spirits, Karma Kitchen provides for an atmosphere you can't help but want to be around at all times. 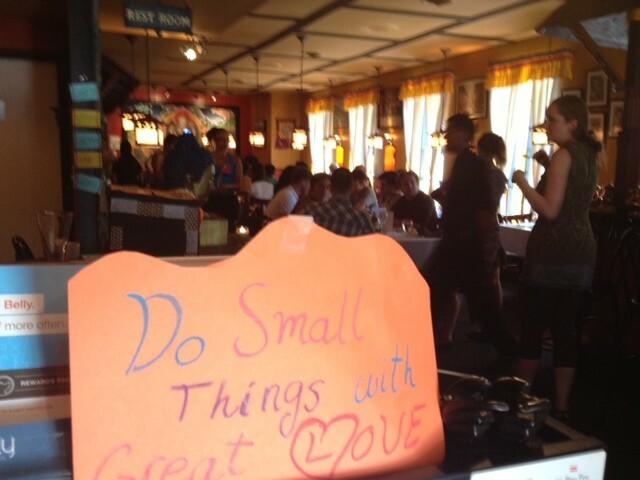 Meals at Karma Kitchen are cooked and served by people who believe in the pay it forward ideology. This selflessness exhibited by both servers and consumers "helps to create a future that moves from transaction to trust, from self-oriented isolation to shared commitment, and from fear of scarcity to celebration of abundance." In a city that perpetuates a politically headstrong personality, Karma Kitchen is a welcome breath of fresh air, an initiative that grounds you in a District known for its high-strung drama. "Karma Kitchen is about reminding us that we can come from a space of abundance which cannot be counted by the number of dollars in our pocket, but can only be felt from the warmth in our heart." 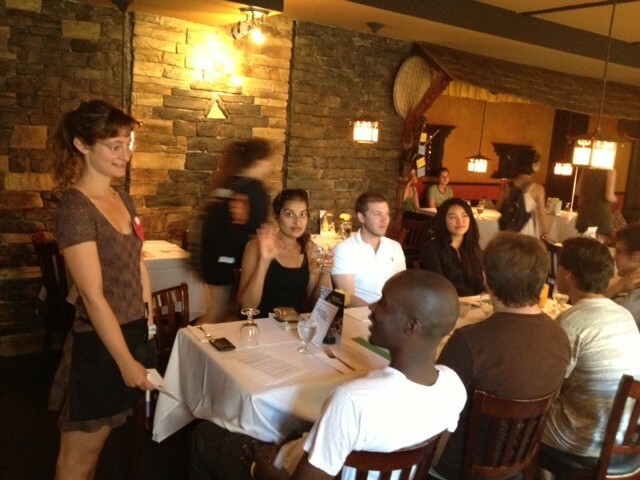 Each month brings a new set of guests and volunteers to the table, a unique group of individuals who make the Karma Kitchen experience unforgettable every time. It has already supplied 36,850 meals since it first launched on March 31, 2007 in Berkeley, California and will continue to grow as a self-driven charity-like restaurant for years to come. 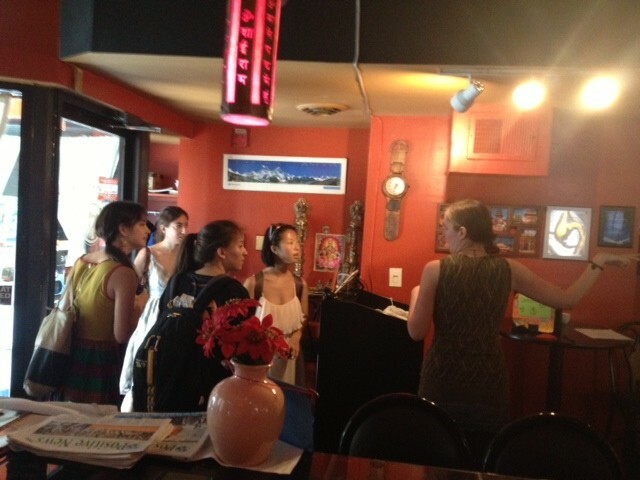 With tomorrow, June 30, marking the last Sunday of the month, Karma Kitchen is due to set up shop once again for lunch. I'm going with a couple of my friends, and I advise you to do so as well. If not for the food or to support the mission, then to get yourself out of your comfort zone to realize that there's more to D.C. than the suits and the never ending work days. We too can be a part of a movement dedicated to inspire the spirit of service in others. First Karma Kitchen in Tokyo! 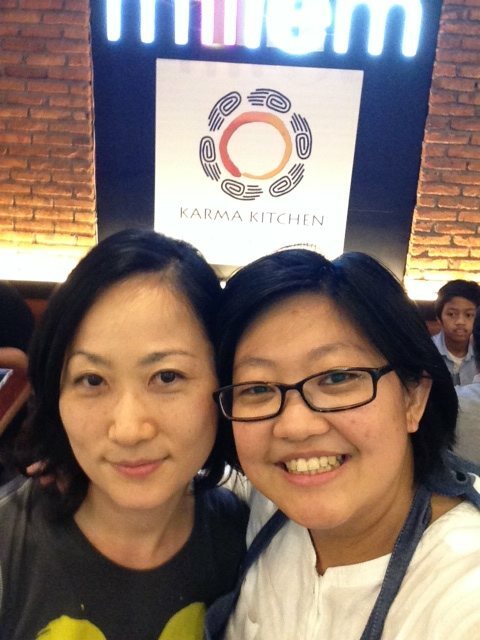 We had our first Karma Kitchen in Tokyo in May and it was amaaaaaazing!!! Everyone enjoyed it so much and we have lots of feedbacks and intention to do more. Kazuwo, our team member, does film documentary, so a proper video will be coming but this is just something I had put together to share at the retreat and thought I'd share on the feed too.